CD runs at 47 min. 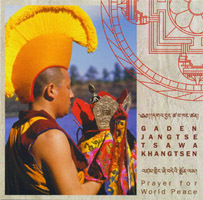 Beautifully recorded deep toned chants for world peace recorded by monks of Gaden Monastery. This CD will help pay for much needed housing for new monks. CD runs at 57 min. Powerful chants,with traditional Tibetan drums and horns. This CD is dedicated to the protectress of Tibet by the monks of Gaden Monastery. This CD will help pay for much needed housing for new monks. CD runs at 57:30 min. Chants,accompanied by Tibetan drums and horns. 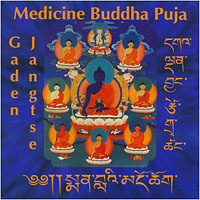 This CD is dedicated to the Buddha of Healing by the monks of Gaden Monastery. This CD will help pay for much needed housing for new monks.